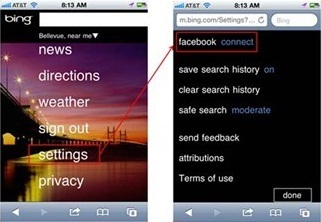 Microsoft search engine, Bing, is trying to bring some competition to Google in the mobile search arena by introducing new features for Bing for Mobile (m.bing.com). Can it take a part from the estimated 90%-95% mobile search market share of Google? Bing claiming to bring million of videos from many resources online like Hulu and YouTube to this feature. Sports videos received special treatment with designated tabs for MLB, NBA, and NHL. This feature can be also connected with Facebook for friends recommendations. 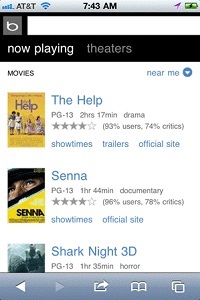 Bing attempts to expand its reach with this location-based feature where you can receive information about movies- Summaries, trailers, Facebook friends recommendations, show times and places. 1. The growing of the social media with the mobile industry- Connecting everything to the most popular social network Facebook. 2. Bing understands that one of the most popular mobile activities is watching videos, therefore launching a feature of videos. 3. Location-based programs and features are gaining great momentum recently and Microsoft is making one of its firsts footholds in this area with the Movies feature.